Australia is not a fixed entity, a collection of outdated bigotries and reactionary credos, but rather an invitation to dream, and this country-our country-belongs to its dreamers…if we are finally to once more go forward as a people it’s time our dreamers were brought in from the cold. 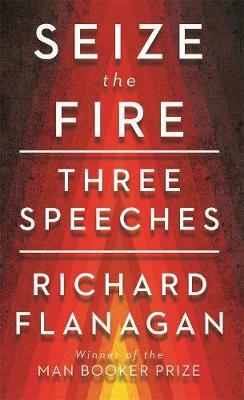 Richard Flanagan’s speeches have become unique literary events attended by sellout crowds, reported in national and international media, and a spur to widespread debate and discussion. Gathered here are three of his recent speeches in which he interweaves topics as diverse as troubadour poetry, love stories and the murder of the refugee Reza Barati; his top ten Tasmanian novels and the Australian Pacific solution; and his much-celebrated National Press Club address where he questioned the militarisation of Australian memory and argued for the need for formal Indigenous recognition.